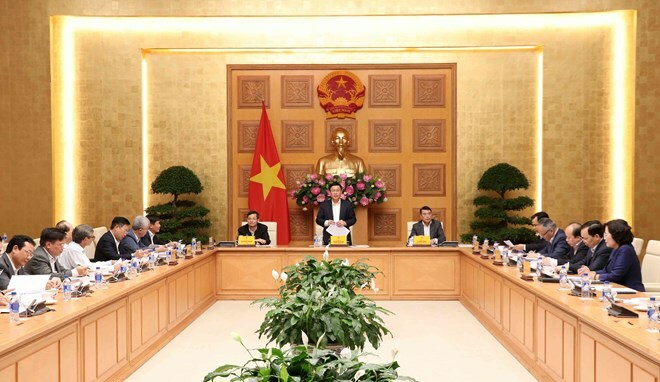 Hanoi (VNA) – The National Advisory Council on Financial and Monetary Policies met on March 28 to assess the economic growth in Quarter 1 and determine factors that can affect growth in the remaining months of the year, including obstacles in the banking and financial sectors. A report of the State Bank of Vietnam (SBV) showed domestic demand stayed stable in the first three months of the year, and consumption and foreign direct investment (FDI) maintained a good growth compared to the same period last year. Newly-registered and additional FDI capital rose by 82.6 percent while FDI disbursement picked up 6.2 percent on a yearly basis. However, export growth has slowed down remarkably, with a 5.4 percent increase this year to March 15 compared to 26.5 percent in the same period last year, according to statistics of the General Department of Vietnam Customs. Low increases in the export of farm produce, aquatic products, minerals, and phone-electronics-computers and parts have affected the growth of industrial production. The SBV estimated the GDP growth rate in the first quarter at 6.3-6.5 percent, which is lower than the unprecedented level of 7.45 percent in Quarter 1 last year but still higher than the Q1 figures of other years since 2009. Deputy Minister of Industry and Trade Tran Quoc Khanh said the growth in foreign trade value is lower than expectation, estimated at 4.7 percent. However, he was still confident that the targets set by the National Assembly could be achieved as there is big room for growth in such sectors as steel, automobile, thermal energy, leather-footwear, textile-garment and agro-forestry-fisheries. The targets set for this year included a 9-10 percent growth in industrial production and 8-10 percent growth in exports. The advisory council’s members shared the view that the domestic economy has remained stable, and there is no need to revise solutions specified in the Government’s Resolution 01 on key tasks and measures to carry out the socio-economic development plan and state budget estimate. They said ministries and sectors have run proactive and flexible monetary policies in close coordination with fiscal policies and others to keep inflation stable, contributing to stabilizing the macro economy and supporting economic growth. They agreed that the currency’s value and the inter-bank interest rate have been kept stable, and total means of payment went up 2.67 percent compared to the end of 2018, thus helping control inflation. The council’s members recommended pushing ahead with measures specified in the Government’s Resolutions 01 and 02 while keeping watch of developments in the domestic and world situations for timely adjustments. Many members suggested that the Government work to remove bottlenecks in the Law on Planning and early complete the adjustment of the Law on Public Investment.